When I first heard about fish tacos years ago, I would have never thought that this combination would be one that I liked – but I was completely wrong. To me, a fish taco is light, yet filling and there are so many ways you can get creative with them. I personally love to sauté my fish in coconut oil first to give an added burst of flavor. Coconut oil is a great replacement for olive oil or butter when cooking and baking, simply replaced in a 1:1 ration in any recipe you’re making. Instead of sticking to the same old lettuce and tomato, I decided to make a mango slaw that compliments all ingredients perfectly. 1. Place all ingredients into a medium size bowl, mix thoroughly. 2. Cover until ready to serve. 1. Mix all seasonings in a small bowl. Coat each fish filet in the seasoning mixture with as much or as little as desired. Drizzle over honey and lime over each filet, then top with mined garlic and set aside. 2. Heat coconut oil over medium heat. Add tilapia filets to pan and cook on each side for 3-4 minutes or until cooked through, depending on the filet thickness. 3. Once finished, remove from heat and place on a paper towel to remove any excess oil. 4. Heat up tortillas in a separate pan for approximately 30 seconds on each side and place onto a plate. 5. 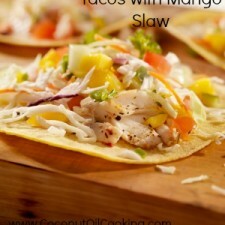 Add fish to the tacos and a heaping pile of mango slaw. Serve and enjoy! I love that you get the flavors of mango, honey, cilantro, lime, and coconut oil all in one. 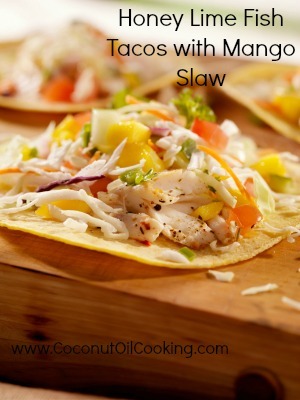 I chose to keep the mango slaw on the healthier side by eliminating the mayonnaise that traditionally goes into this recipe. Sour cream, shredded cheese, and even salsa can be added for an additional kick.